So let's look at currency flows, reserves, and debt. The demise of the US dollar has been a staple of the financial media for decades. The latest buzzword making the rounds is de-dollarization, which describes the move away from USD in global payments. Look, I get it: the US dollar arouses emotions because it's widely seen as one of the more potent tools of US hegemony. Lots of people are hoping for the demise of the dollar, for all sorts of reasons that have nothing to do with the actual flow of currencies or the role of currencies in the global economy and foreign exchange (FX) markets. I understand the emotional appeal of this, but investors and traders can't afford to make decisions on the emotional appeal of superficial claims—not just in the FX markets, but in any markets. 1. International payments. This can be thought of as flow: if I buy a load of bat guano and the seller demands payment in quatloos, I convert my USD to quatloos—a process that is essentially real-time—render payment, and I'm done with the FX part of the transaction. It doesn't matter what currency I start with or what currency I convert my payment into to satisfy the seller—I only hold that currency long enough to complete the transaction: a matter of seconds. The only nations that don't need to hold much in the way of currency reserves are those that issue a reserve currency—a so-called "hard currency" that is stable enough and issued in sufficient size to be worth holding in reserve. 3. Debt. Everybody loves to borrow money. 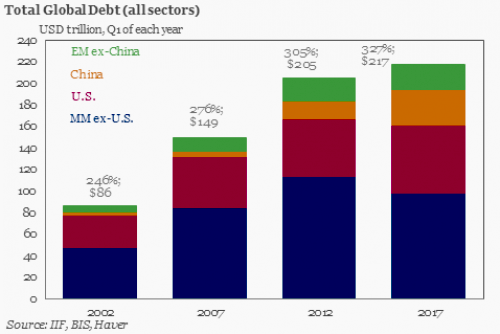 We know this because global debt keeps rising at a phenomenal rate, in every sector: government (public), corporate and household (private sectors). See chart below. 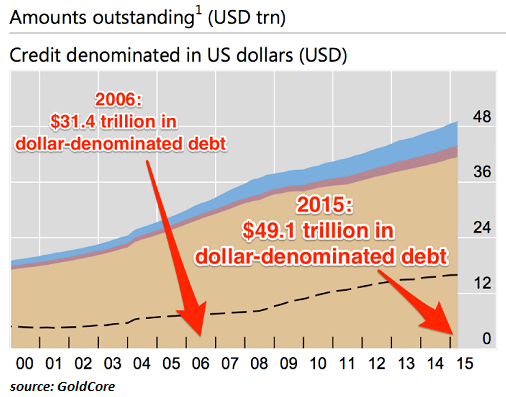 Notice the difference between payments, reserves, and debt: payments/flows are transitory, reserves and debt are not. What happens in flows is transitory: supply and demand for currencies in this moment fluctuate, but flows are so enormous—trillions of units of currency every day—that flows don't affect the value or any currency much. 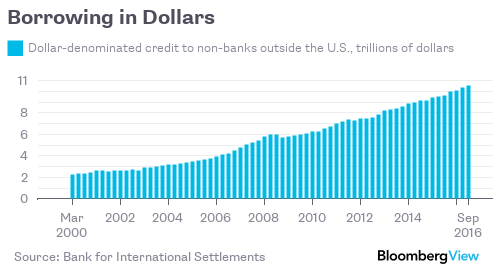 What matters is demand for currencies that are enduring: reserves and debt. The same 100 quatloos can be used hundreds of times daily in payment flows; buyers and sellers only need the quatloos for a few seconds to complete the conversion and payment. Another source of confusion is trade flows. If the US buys more stuff from China than China buys from the US, goods flow from China to the US and US dollars flow to China. As China's trade surplus continues, the USD just keep piling up. What to do with all these billions of USD? One option is to buy US Treasury bonds (debt denominated in dollars), as that is a vast, liquid market with plenty of demand and supply. Another is to buy some other USD-denominated assets, such as apartment buildings in Seattle. This is the source of the petrodollar trade. All the oil/gas that's imported into the US is matched by a flow of USD to the oil-exporting nations, who then have to do something with the steadily increasing pile of USD. Note what happens to countries using gold as their currency when they run large, sustained trade deficits. All their gold is soon transferred overseas to pay for their imports. So any nation using gold as a currency can't run trade deficits, lest their gold drains away. This means any nation running structural trade surpluses will have difficulty issuing a reserve currency. Nations shipping goods and services overseas in surplus end up with a bunch of foreign currencies—whatever currencies their trading partners issue. This is opposite of the global markets need, i.e. a surplus (supply) of the reserve currency. So let's look at currency flows, reserves, and debt. In terms of currencies used for payments, the euro and USD are in rough parity. Note the tiny slice of payments made in RMB/yuan. This suggests 1) low demand for RMB and/or 2) limited supply of RMB in FX markets. The USD is still the dominant reserve currency, despite decades of diversification. Global reserves (allocated and unallocated) are over $12 trillion. 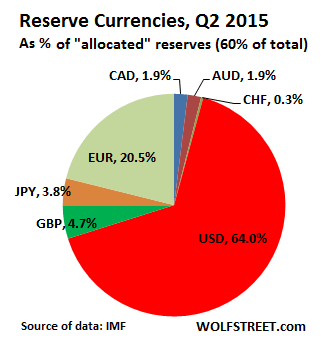 Note that China's RMB doesn't even show up in allocated reserves—it's a non-player because it's pegged to the USD. Why hold RMB when the peg can be changed at will? It's lower risk to just hold USD. The debt remains obscured from view. Accounting conventions leave it mostly off-balance sheet, as a derivative, even though it is in effect a secured loan with the principal to be repaid in full at maturity. Only footnotes to the accounts report it. So let's wrap this up. To understand any of this, we have to start with Triffin's Paradox, a topic I've addressed numerous times here. The idea is straightforward: every currency serves two different audiences, the domestic economy, and the FX/global economy. The needs and priorities of each are worlds apart, so no currency can meet the conflicting demands of domestic and global users. If a nation runs trade surpluses, it has few means to emit enough currency into the FX market to fulfill all three needs: payment, reserves, and debt. Personally, I would like to see a free-floating completely convertible-to-gold currency. Such a currency need not be issued by a nation-state; a private gold fund could issue such a currency. Such a currency would fill a strong demand for a truly "hard" currency. The point here is that such a currency would have difficulty becoming a reserve currency and replace the USD in the global credit market.